Beth Ditto vamps in some gorgeous clothes by Alexander McQueen & Christopher Kane in "Feminist," a short film by Nick Knight. Check out the Gossip frontwoman here. I'm late in posting about the amazing fat-positive photography of Leonard Nimoy (yes, that Leonard Nimoy). The most recent news is that Lady Monster, one of Nimoy's models, has been given permission to create a MySpace page for The Full Body Project. Marilyn Wann (author of Fat!So? Because You Don't Have to Apologize for Your Size ) interviewed Nimoy for a December 2007 article in SMITH magazine. A list & links to other articles and interviews with Nimoy can be found here. Five Ties Publishing collected the photographs in a book published last month. "Vicky's Secret," a short story by Mary Saracino, is the winner of the Second Glass Woman Prize. Saracino's short story, in which a middle-aged divorcee finds empowerment through an unlikely mass media image, was chosen from among 364 entries in the writing contest facilitated by Beate Sigriddaughter of Denver, CO. The short story is available online at Sigriddaughter's website and will also be published in the March 2008 edition of Moondance. Sigriddaughter funds the Glass Woman Prize with 10 percent of her personal income. "My criterion is passion, excellence, and authenticity in the woman's writing voice." The "Glass Woman" title comes from her desire for women "to be able to acknowledge, transparently, who we are, and that who we are is not trivial and unimportant, despite the fact that is it not typically rewarded in a man-made and money-motivated world." Sigridaughter's Glass Woman would be made of "unbreakable glass, transparent, but shatter-proof." Saracino's novel The Singing of Swans (published by Pearlsong Press in October 2006) was a finalist in the Spirituality category for the 2007 Lambda Literary Awards. The Singing of Swans is a novel about the divine feminine in the form of the Black Madonna. The story of Madalene Ross, a thirty-year-old American woman cut off her body, her heart, and her sense of purpose in the world, is interwoven with the lives of three women: Rosalina, a priestess of Persephone in 70 B.C.E. Sicily; Ziza, a strega (Italian witch) in 16th century northeastern southern Italy; and Ibla, an herbalist and painter in 18th century southern Italy. An environmentally compromised lake in Sicily also acts as a portal to the rich tradition of pre-Christian spirituality that lies beneath Church dogma. I am moved by all your writing, your passion, your thoughts. Our voices are important. Above all, keep writing! Ursula Le Guin writes, "We are volcanoes. When we women offer our experience as our truth, as human truth, all the maps change. There are new mountains." Sigriddaughter is now receiving entries through March 21, 2008 for the Third Glass Woman Prize, for a piece of short fiction or creative nonfiction written by a woman. For details, see http://www.sigriddaughter.com/GlassWomanPrize.htm. Savannah Lee blogs about Size Acceptance Through Art History 101 with some nice links to voluptuous classical paintings. Believe me, if you sit in an art history class, you learn that the well-upholstered body was the "norm." Not the exception....as the images click by, hour after hour, class after class, you inevitably realize--this is our natural state. This is how humans are. We're not skinny. We're like otters and seals; we're voluptuous....So the next time you see something about the "obesity epidemic," just consider it a return to normal. Read the entire post (with its luscious links) here. probably the only woman in the history of the world who's walked the catwalk for Jean-Paul Gaultier and John Galliano, worked as a maternity nurse, been a member of one of the two contemporary dance troupes in France, played the title role in a surrealist farce and walked the red carpet at the Cannes Film Festival at a weight of 300 pounds. Speaking to Velvet, I felt I had encountered a true creative artist, utterly devoid of pretension, who did exactly what she wanted because it had never occurred to her to do anything else. She's up for anything, accepting all projects and offers that pique her interest. It's an approach to life that can perhaps best be summed up by a quote from Helen Keller that Velvet keeps above her desk: "Life is either a daring adventure or nothing." Read Sirmons's interview of Velvet here. Pearlsong Press sponsored a 3-hour "Ancient Images/Modern Icons" presentation by Mary Saracino in Nashville last October. It was wonderful. Now she's joined with ceramic artist Sheila Hennessy to offer a four-day workshop in the southwest, exapnding her presentation to include hands-on artmaking. I've posted information from the workshop flyer below. 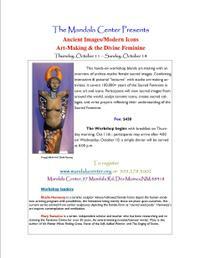 Mary Saracino and ceramic sculptor Sheila Hennessy are teaching "Ancient Images/Modern Icons: Art-Making & the Divine Feminine" at the Mandala Center in Des Moines, New Mexico Oct. 11-14, 2007. Hennessy is a ceramic sculptor whose hollowed female forms depict the human condition as being pregnant with possibilities, the limitations being merely those we place upon ourselves," according to the workshop flyer. This hands-on workshop blends art-making with an overview of archeo-mythic female sacred images. Combining interactive and pictorial "lectures" with studio art-making activities, it covers 100,000+ years of the Sacred Feminine in cave art and icons. Participants will view sacred images from around the world, sculpt ceramic icons, create sacred collages, and write prayers reflecting their understanding of the Sacred Feminine. The workshop begins with breakfast Thursday morning, Oct. 11. To register, go to www.mandalacenter.org or call the Center at 505-278-3002. Abby Ellin has a nice article about Leonard Nimoy's fat-positive photography in the Sunday New York Times. Yes, that Leonard Nimoy. Star Trek's Spock. You can see some of Nimoy's photographs, including his series of photographs celebrating feminine spirituality as well as his "Full Body Project" nudes, at his website www.leonardnimoyphotography.com. The direct link to the webpage on his "Full Body Project" is here.